People have a window herb garden for many reasons. 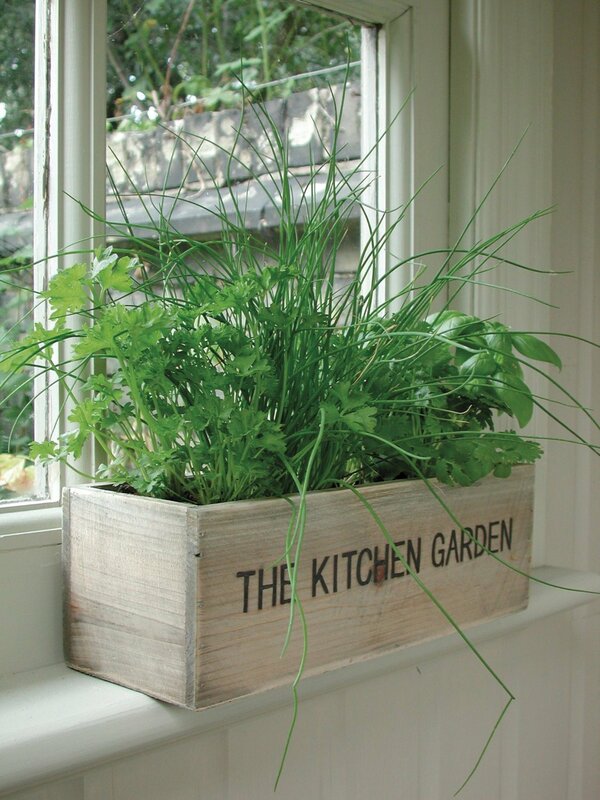 Some don't have an outdoor space, so need to make use of their windowsills, sometimes they want a few herbs growing inside over the winter and some people just like growing plants inside and it might as well be herbs. There are some downsides to growing herbs on your windowsill. Watering is easily monitored but you will need to make contingency plans if you are away for a period of time. Most houses have even temperatures, but that can be affected by the intensity of light the plants are getting. Light is the hardest thing to control. On a windowsill, you often get scorching sunlight for part of the day and shade for part of the day. You will need to make sure that your herbs get enough light so they don't grow leggy and get weak but not too much that their leaves get burned. Blazing sunshine through a window has the same effect as a magnifying glass - your herbs will get extremely hot as well. You need to select your window - a north or east facing window might be best as the sunshine will not be too fierce all day. South and west facing windows will need monitoring by you in hot weather. Try not to let the leaves touch the glass - in very cold or hot weather, they will suffer. If you don't have the right facing window, then try shading the window with a heavy net at plant height. It will be better than nothing. Plants will always grow towards the light, so it's important to help them grow evenly by turning the pots every few days. So, which herbs to grow indoors? As always, the answer is - the herbs you use the most. Logically, you wouldn't keep a huge rosemary or sage bush indoors, but you could take cuttings from the plants so that they will be small. Basil is an easy herb to grow inside. It's a neat bushy plant and is tender, so it's not going to survive all year outside anyway. A pot of chives would be handy as well. Just dig up a few bulbs and put them in a pot. You can snip them off as you need them, giving the plant a 'haircut' so as to keep it small. Mint can grow to be very large but two or three runners in a pot is manageable and useful for cooking. Thyme can also be kept small by snipping it off as you need it. 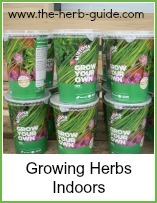 There is a link here for growing individual herbs with advice about growing each one indoors. You will need a long tray or individual dishes to put the pots in. If you're gardening on a shoestring, then ordinary plastic pots will be fine and little plastic dishes or saucers. If you want something more decorative to co-ordinate with your decor, there are pottery planters that you can sit the pots in. Or use a long window box. Don't make the mistake of planting directly into these planters as they don't usually have drainage holes and so the plants will become waterlogged but the bonus here is that you won't need dishes to put underneath. All you need to do here, is plant your herb in an ordinary pot then put it in your decorative planter. 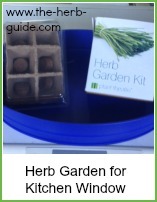 Caring for your window herb garden should be relatively easy. 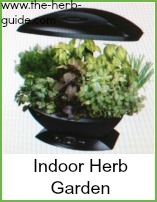 Just water the herbs when they begin to dry out or wilt and turn the pots/box so that the plants get even light. 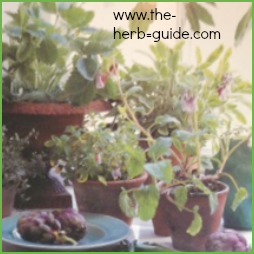 Snipping the herbs to use should be enough to keep them from outgrowing their pots. If they do get too large, then harden them off and move them outside. Or you could cut the excess and either freeze or dry the herbs. If you find you're getting bugs, then immerse the whole pot and plant in a bowl of water for about 15 minutes, then leave the pot on the draining board to get rid of the excess water.